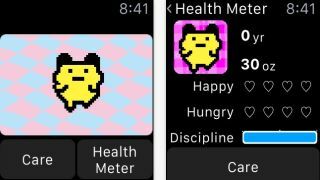 If part of the point of smartwatches is to help you spend less time looking at screens then Bandai Namco must not have got the memo, because it's unleashed its Tamagotchi Classic virtual pet on to the Apple Watch. The latest update to the most demanding pet imaginable will bring an alert to your wrist if your Tamagotchi calls for you, as well as letting you check its status and take care of its needs from the watch. Needs which include thrilling activities like feeding it or taking it to the toilet. Not all the features work from the Apple Watch though, as you'll still need to dig out your iPhone to play games with it. But you'll now get constant wrist-borne reminders that you've agreed to provide more care and attention to a virtual creature than you probably give to yourself and your loved ones. Or you can ignore it and feel guilty when it dies. It's your call. If you can live without Apple Watch support there are plenty of great iPhone games.